Copyright Kobi Ledor, MD, 2008. All rights reserved. Right. You’ve gotten this far, so you must either have a sizable budget or you don’t yet know what Picasso’s paintings are going for. Or you may simply have stumbled onto this page by accident. So caveat emptor: if you don’t have seven figures or more to blow on a painting or at the very least something in the high sixes for a small work, then you’re reading beyond this point strictly out of interest. Not that there’s anything wrong with that! Frankly, most of what I have to say on the subject I’ve already spelled out in the prints and drawings guides elsewhere on our website—just add a few zeroes and you’ve got the idea. And as with his drawings, there’s no point in rating Picasso’s entire output (as I have done with his prints). Not only are his paintings and drawings too plentiful, but ratings also would have little practical value. Ratings are useful with his prints, because one can use them in developing a short list of one’s favorites and then tracking them down. Such a method for acquiring his “uniques” (paintings, drawings, and sculptures) would be much less useful because of the formidable number of works and the bottleneck of supply. Most of his best paintings are in museums. Many of those in private hands are owned by his heirs, and the heirs, apart from Marina, currently don’t release much. We’ve spoken about the black hole of museums. This is nowhere more of a problem for the Picasso collector than with regard to paintings. Quality Picasso paintings are steadily disappearing from the market due to the relentless pace of museum bequests and purchases. There are still many available late Picasso paintings, which until recently have lagged behind earlier periods in appreciation, but most of the great early paintings have long ago found permanent homes. The wild card is whether his estate will release more in the future, but so far, with the exception of Marina, that remains for the most part wishful thinking. 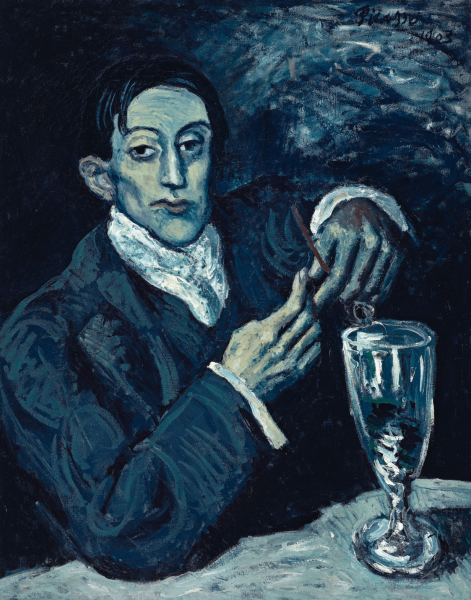 Thus, for example, when the 1903 painting Portrait of Angel Fernandez de Soto (see above) came up for auction in 2006, it was a rare buying opportunity, because it represented the best Blue Period oil not yet in a museum. It was however withdrawn the morning of the sale due to litigation concerning its alleged forced sale during the Nazi era. The problem of supply is especially acute with regard to great paintings at reasonable prices. Therefore, if you’re hunting for Picasso paintings, you’re going to have to look everywhere to maximize your options. Chances are you’re going to have to bark up three different trees: dealers, auctions, and brokers. So perhaps the most useful thing I could do on this subject is provide a perspective on the brokering game, since it is less straightforward than the other avenues and would otherwise take a while in the trenches to get a handle on it. Note that I lump art advisors and consultants in the same category as brokers. There are differences (primarily that art consultants/advisors look for works for you, whereas brokers represent the works), but there is an overriding similarity: brokers and consultants don’t own the art or even have it in their possession. And most art dealers also broker the sale of art, myself included. Ah, the dreaded art broker, the middleman whom everyone would like to eliminate, if only they had his Rolodex! (Kids: that’s the word for the old-time, pre-digital database.) The nature of the brokering game is that everyone wants to shoot the messenger. Buyer, seller, and broker alike would like to eliminate the daisy chain of brokers that separates them, or at least reduce it in length. They may not wish to eliminate the go-betweens altogether, because otherwise the buyer and seller would have to communicate with each other directly, which would potentially compromise their privacy. And at this level, the players tend to guard their identities quite carefully. But since each broker naturally tacks on a certain percentage to the price tag, the more brokers there are in the food chain, the higher the ultimate price of the work. Among successful Picasso paintings brokers, that percentage varies generally between one and ten per cent, in inverse proportion to the price of the painting. Sure, it makes sense for the buyer to want to get as close as possible to the source, in order to reduce the price. And, as a corollary, each broker wishes the others in the deal would just pack up and, to put it politely, retire to Florida. Still, the game is worth playing, because you can find some great works through brokers that you would otherwise have never known about, and you can get some essential advice from us along the way. Also, it is particularly attractive to buyers when a broker has sourced a work from a private collection, because the mark-up tends to be far less than a dealer’s mark-up for art that he has purchased. If you think about it, that makes abundant sense. If a dealer ties up a sizable chunk of cash to invest in an artwork, he expects a healthy return on his investment. If he is merely brokering the sale, however, he hasn’t invested any funds to speak of, mostly just his time, so he is willing to settle for a far smaller slice of the pie. So, enough. Time to look at some art. Though if you haven’t yet had enough of the written word, you could read through my guides to collecting drawings and original prints, which provide much more specific information, especially the latter. For more on paintings, you could glance at my blogs on this topic, or you could take a look at our paintings.